One person was killed, and more than 100 others were injured, Saturday in France during a series of massive protests targeting President Emmanuel Macron’s recent decision to ratchet up gas taxes. French officials estimated that more than 244,000 protesters were involved in several thousand protests across the country. The country’s Interior Ministry said 52 people were detained while security forces used tear gas in several places to unblock major routes. 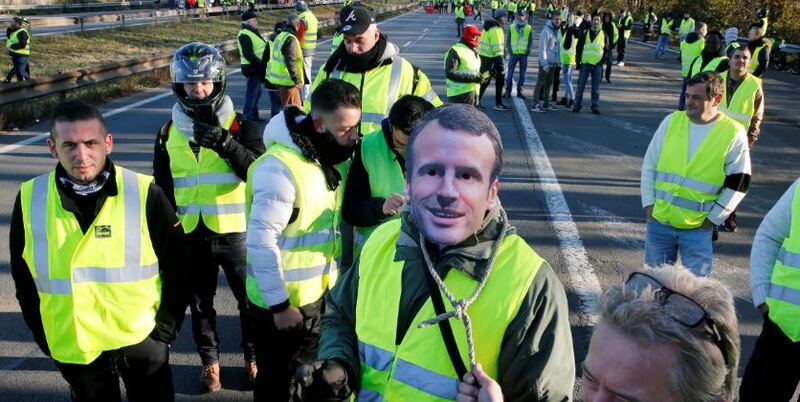 The protests come after the government moved to increase gas taxes, which is part of Macron’s strategy to wean France off oil and gas. But many French citizens see them as an example of the French president’s inability to understand the plight of the country’s working class. The price of gas rose in January by 7.6 cents per liter in France and the price of diesel by 3.84 cents. To put that into perspective, 3.8 liters of fuel is equivalent to about 1 gallon of gasoline in the U.S.
Saturday’s demonstrations were unusual as none of them were sanctioned by the country’s powerful unions or politicians. The strife does not bode well for Macron, who’s approval rating is at dangerously low levels. France has gone after the oil and gas industry. Macron issued a freeze on any new oil and gas leases in 2017 and intends to ban all oil and gas drilling by 2040. The protests come at a particularly dicey time for Macron, who is parried with U.S. President Donald Trump this month over the definition of nationalist.